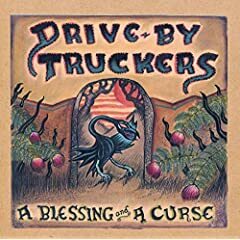 One of my favorite bands, the Drive-By Truckers, release their A Blessing and a Curse album tomorrow, and I'll be headed out to pick it up at an independent record store (to get the bonus EP as well). My music preorders this week included Matthew Sweet and Susanna Hoffs' Under the Covers, Vol. 1 (I am a fan of all things Matthew Sweet), Poetry On Record: 98 Poets Read Their Work (1888-2006), A Whisper in the Noise's As the Bluebird Sings, and Fell's self-titled album, but I am most looking forward to spinning Dudley Perkins' Stones Throw release, Expressions. The single, "Funky Dudley" (mp3 link) has quickly become one of my favorite tunes of the year. Even though Steven Soderbergh (one of my favorite directors) directed Yes 9012 Live, I'll rent that some day and pick up the George McGovern documentary, One Bright Shining Moment this week. What new releases can you recommend? What are you buying this week?